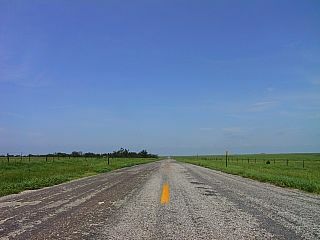 I can't fit Kansas in my camera. I've heard some people complain about the featurelessness of the prairie, but it is the wide-open spaces that give this land its visual and spiritual appeal. But the only way to appreciate the vastness of being here is by actually being here. The pictures I take are just snapshots of a line on the horizon, and I don't know how to show you the emptiness all around me. Today's ride, although high in miles, wasn't too challenging physically. Once again I had a wind from the south that forced me to expend some extra energy, but at least it wasn't a headwind. With straight roads to ride on, and scenery that seemed to stretch forever, it was a good day for thinking. Sometime last week I was watching a raptor that was flying overhead. I thought to myself that the bird wasn't worrying about what it would eat next week, or what it would eat next month. All the bird had to think about was the moment, and the future would provide for itself. It was when I had that realization that I decided to stop worrying about what comes after the ride. Worrying would only detract from my enjoyment of what I'm doing now, and it probably wouldn't have any actual effect on the future. With that decision my thoughts have been left free to wander more productively, and that is mostly what they did today. 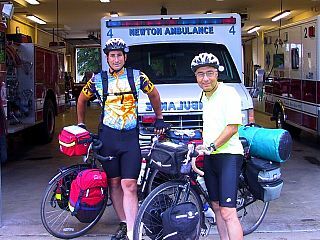 Although it isn't mentioned in my maps or guidebook, the fire station in Newton has been letting cyclists stay the night for a few years. I had heard about it through the grapevine on the road, and when I got to town I rolled up to the fire station and introduced myself. It turned out that Bob George, whom I hadn't seen since Carbondale, was already in the spare room they usually let cyclists have. I was welcome to sleep on the floor in their training room, which was an offer I was happy to accept. My alternative in Newton would probably have been to camp in their city park, but staying in the fire station turned out to be a much better choice. Shortly after I arrived in town the sky turned black with heavy clouds and rain began pelting down upon the plains. Through most of the night the alarm bells in the station kept ringing with every alert and warning that the National Weather Service issued. A tornado warning was in effect and baseball sized hail was reported in the area. With thunder and lightning crashing down around the town, I thought to myself it was a very good night to be indoors. Your experience with the raptor is interesting. Someone recently told me that certain things have to be taken on "faith" if they are to be accepted. It certaintly is a lesson for me! Cool, did you get to slide down the pole? Or amaze them with tales of Rob and gas cans? I am loving your journal and the comments it engenders. This is indeed a most beautiful and amazing country, filled with nice people. As you have found, the places some say are boring or not beautiful or interesting, are if you take the time to look at what they have to offer. I believe it was around 1968 when John Gage and Roy Dasoto stopped by that station. From that day on, it was history. Emergency, and engine 51 would never be the same. Just remember, if you need first aide, always start with an I.V. with D-5-W, Stat!